Looking for a unique gift for a loved one? Our Fuel or home heating oil vouchers are a great way to show you care! Simply fill out the order form below to purchase your Top Oil Gift Voucher and we will post it out on your behalf. 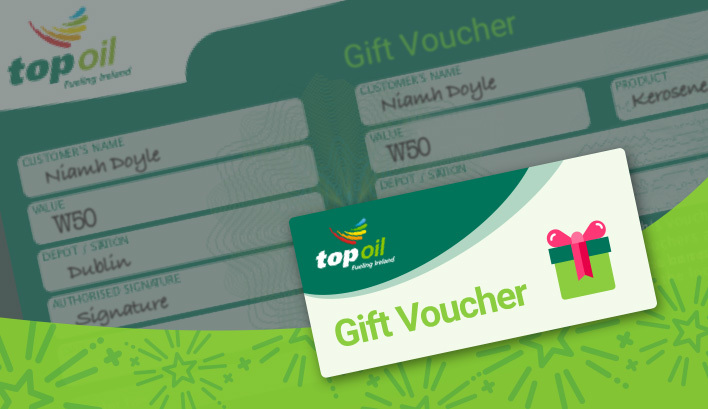 Hope you enjoy this Top Oil Gift Voucher! Sign-up to receive news and offers by email. Sign-up to receive news and offers by text. You can add a free personalised message to your gift. Let us know where the voucher should be delivered by entering the recipient address. You will receive a receipt of your purchase by email. We won't use your email for anything else unless you sign-up for receiving our offers later on that form. We're currently processing your payment. Do not press refresh or the back button on your browser or your payment may not be processed. This payment could not be processed.